Folk are often sceptical about how much influence a kit can have over the fortunes of a team. However I've seen too many examples where a good looking outfit could arguably be seen to play a part in raising confidence levels within a side to dismiss this thinking. Similarly when a new kit supplier arrives with a kitbag full of new ideas, after a long period with a previous incumbent they can be like a breath of fresh air that can also inspire and change for better the fortunes of a stagnating team. I'm not stating as fact that both these kit situations were key in Manchester United clinching their first league title for 26 years in 1992-93 (and the inaugural award of the then newly rebranded ‘Premier League’) but I certainly feel they played their part. As I've often been told by kit designers through the years, when a team looks good, they play good. By 1992, United had been kitted out by adidas for 12 years and despite some nice enough designs along the way, the relationship did appear to be going stale. Simultaneously, the club were also struggling to get their hands on that all-important league trophy that had eluded them for so long. But with Alex Ferguson’s young side gathering strength season upon season, the final piece required in the Old Trafford puzzle was an absolute humdinger of a kit to spur them on to glory. 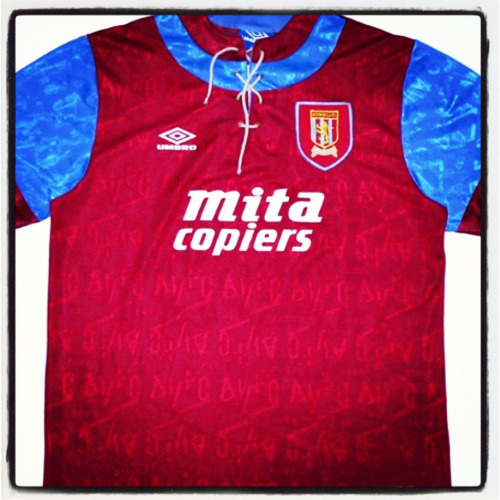 Up stepped Umbro who absolutely stormed it with one of the greatest shirts in United’s history and one that was the starting point for an era of almost unrivalled success. The early '90s were witness to a post-modern acknowledgement of past football fashions that complemented the technological advances and contemporary styles of the day. Out went the sleek, modernist approach that defined the '80s and in came proper old-fashioned collars and button-up plackets, inspired by kits of yore. 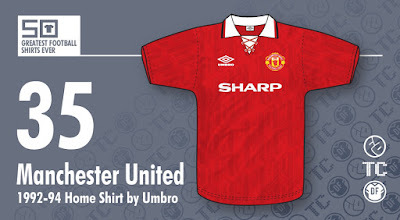 In United’s case, though, Umbro pushed the retro feel even further and even introduced a lace-up collar – a style that in 1992 had last been seen regularly in football 60 years previously. Combine this with the flamboyant, baggier shirt sizing that was widespread in fashion both on and off the pitch at the time, liberally decorate the fabric with a 3D geometric jacquard weave of the club’s initials, add the familiar and iconic Sharp logo and sprinkle just the right amount of red and black trim, and you have yourself a bona fide classic kit. One that was fit for champions.